Las Calaveras | Chicago's Pipe, Cigar & Tobacco Store | Iwan Ries & Co. Crowned Heads Las Calaveras was inspired by “La Calavera Catrina,” a zinc etching by Mexican printmaker and illustrator, Jose Guadalupe Posada. The image depicts a female skeleton dressed only in a hat, and has become an icon of the Mexican Dia de los Muertos, or Day of the Dead. The holiday focuses upon gatherings of family and friends to pray for and remember those who have died. Beginning with the Edicion Limitada 2014, Las Calaveras will be an annual release that is a respectful homage to those who have passed away in the year before, and is intended to be a celebration of their lives and remembrances, rather than a mourning or a symbol of sadness and death. Each year, we all lose a friend or loved one, or know of someone who has endured that same loss. In today’s fast-paced world, it is all too easy to forget the fragile nature that is life. Often, in the race to gain material success, we lose sight that our true legacy are the lives we touch and the love we leave behind once we pass on. It is in this spirit that Las Calaveras pays tribute to those who have touched our lives and shared their love. With each year’s annual limited release, the blend and presentation of Las Calaveras will be altered. What will remain the same, however, is the spirit behind the cigar. We hope that with this annual remembrance, we will choose to celebrate–rather than mourn–the lives of those who have so graciously shared their legacies with us. 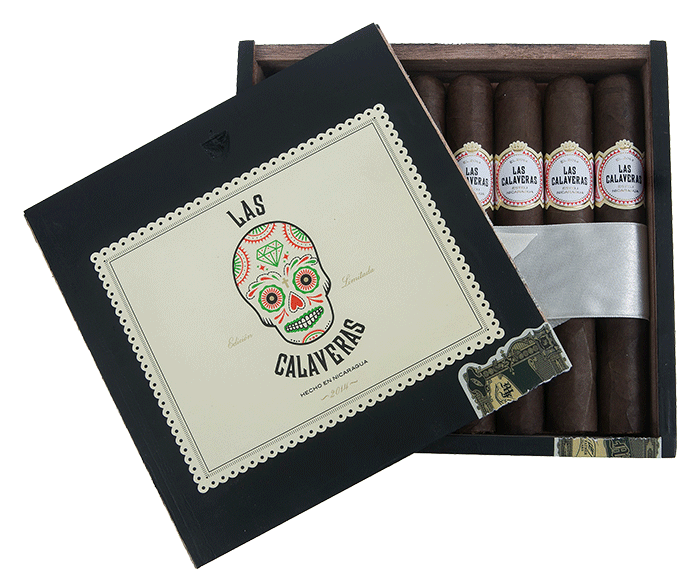 Las Calaveras is packaged in 24-count boxes, each containing 3 rows of 8 cigars. The 3 rows represent life’s cycle of a beginning, middle, and end. In biblical terms, the number ‘8’ signifies new beginnings, and in mathematical terms an ‘8’ laid on its side symbolizes “infinity,” as in eternal life.